Amelinda Bérubé is the author of UNDER THE ICY LAKE, a YA ghost story coming from Sourcebooks Fire in 2018. She’s spent the last ten years as a writer and editor with the Canadian public service, prior to which her career path meandered through academics, carpentry, and administrivia. Amelinda is a passionate fan of YA, SFF, and all things spooky and is delighted to be on the other side of the contest curtain for the first time! A former dancer’s grip on sanity starts to slip when she begins to think a dark entity is stalking her and craves her life. Coming 2018 from Sourcebooks Fire. Amelinda’s Query Critique . . . Thanks to Brenda, Heather and the PitchWars team for a chance to share some thoughts on a query! My suggestions are in [square brackets] below. To the courageous author: As with any critique, my comments and ideas are yours to take or leave or adapt as you see fit. Query writing can be exhausting and horrible (I lost count of my own query swaps somewhere past 20) but try to keep an open mind and a willingness to play with it. You got this! MAGICAL THINKING is a 93,000 word contemporary romance with blended fantasy and paranormal elements in the Neil Gaiman tradition. [I’m not super familiar with romance as a genre, but this sounds like contemporary fantasy with strong romantic elements to me. My understanding is that romance would stay pretty firmly grounded in reality, but others might correct me there.] It combines Buffy the Vampire Slayer’s paranormal quirkiness [would be great if you could inject some of this quirky voice into the query, which would give a taste of the fun read that lies in store. Again, touches like “epic dating fail” and “mega famous” are a great start in that direction! Consider how Helen might narrate this, maybe – not that you’d use first person, but it might give you some vocabulary to work with. Like, if you were to introduce Brian with a statement like “Brian isn’t exactly a dream come true…” how would you end it?] with irreverent characters that could populate Judd Apatow’s critically acclaimed show Love. I work as a literacy tutor. [Can you add another sentence or two to keep this from sounding abrupt? Education, location, something interesting about yourself?] Thank you for your time and consideration. Overall I think my recommendations boil down to focusing on the emotional arc of your main character. Use that as the foundation of your query; the plot (and the supernatural elements) can unfold around it. What are her fears? (Is she afraid deep down that she’s unworthy of love, for example? That would probably be exacerbated by a fate-manifested solution, actually, because she might worry that she doesn’t deserve it…) Not something you need to explain straight out, but something to consider as you outline the story; it will help you put the emphasis in the right places. Hope this is helpful, and best of luck in PitchWars! MAY THE ODDS BE EVER IN YOUR FAVOR. Alicia Clancy graduated from the University of Tennessee with a degree in English Literature, and moved immediately to NYC, where she began her career in book publishing. She lives in Hoboken, NJ with her husband and her cattle dog puppy, Whiskey. She is the author of Be My Galentine. From Girl Squads to Galentine’s Day, female friendships have reached a new level of awesome. Gone are the days of competition and backstabbing (well, mostly)–female empowerment is in and it’s here to stay! This illustrated book aims to highlight the positive nature of friendship between women with a little bit of charm, and a whole lot of sass, and offers fun extras like recipes and themes that can take your girls’ dates to the next level! 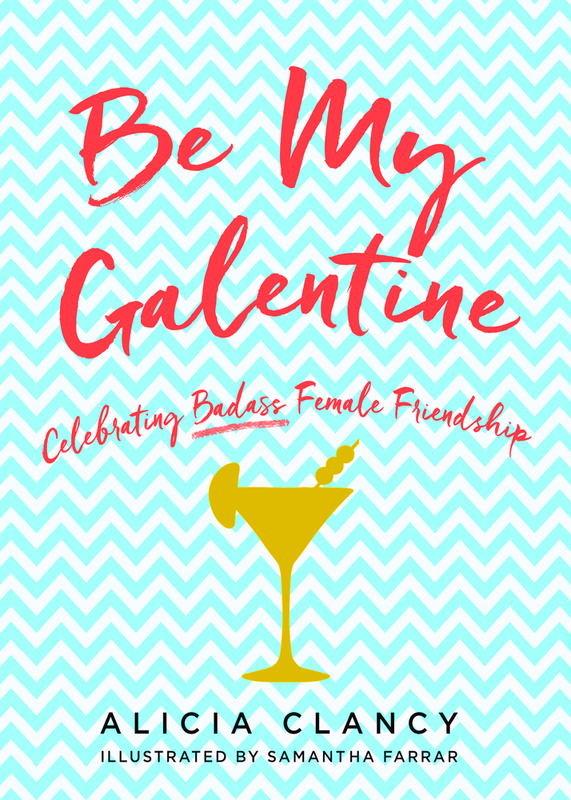 Celebrate your best friends, your soul sisters, your gal pals, your partners-in-crime with this humorous gift book, and make every day feel like Galentine’s Day! Because let’s face it, fabulous friendships deserve to be celebrated all year round! Alicia’s Query Critique . . .
After seeing you (somewhere)[,] I did a little digging and was happy to find that you are looking for [YA fantasy].stories that express an author’s unique point of view and sensibilities. I think you would be a great fit for my new adult, urban [I hope that my fantasy novel, THE IN-BETWEEN. will be the perfect fit for your list. Complete at 110,000 words, my dual-POV fantasy novel will appeal to readers of Sabaa Thair’s AN EMBER IN THE ASHES and Becca Fitzpatrick’s HUSH, HUSH.] The Mortal Instruments Series(Cassandra Clair) will enjoy the similar elements of action and romance in my book. [FYI, best to not use books that have sold over a million copies as comp titles, and also, you have to decide if your novel is YA or new adult. You wrote new adult originally in the pitch, but it sounds YA to me. If it is, in fact, new adult, you’ll need to find new adult comp titles]. Cally’s fear can draws them to her. Michael, her protector, is training her to control her emotions by counting backward from five, imagining her worst case scenarios. The only problem is that now when she closes her eyes, Cally doesn’t have to imagine anything, [. H]her reality is more terrifying than any nightmare she could conjure up. Five: Her father is dead. Four: They’ve taken her mother. One: They won’t stop until they do. I minored in English Literature [at] WSU and I’m [am] an active member in the[ir] writing community. I’m [also] a member of the League of Utah Writers and have been a featured author for Immortal Works. I’m on a steady diet of YA fiction and I study Martial Arts. AND OUR LAST WORKSHOP CRITIQUE OF 2017 . . .
Juliana’s First Page Critique . . .
“Okay, see you later.” Tanya hopped out of the car and closed the door. Thank you, Juliana, Alicia, and Amelinda, for your critiques! This concludes our Query and First Page Workshops for Pitch Wars 2017. We hope you’ve enjoyed the critiques and have learned along with the authors. The participating agents will be announced this Friday, July 14th. And the Pitch Wars Mentor Wishlist Blog Hop starts July 19. So get those queries and manuscripts ready, because the Pitch Wars submission window opens on August 2nd!